IN THE YEARS BEFORE THE START OF WORLD WAR II the Type 95 biplane and Type 97 monoplane were combat types that were heavily involved in action. SMN report: Their pilots fought against the Chinese, the Soviet Union, and the American Volunteer Group in China. By 1941 the Types 95 and 97 were reckoned to be obsolete for front-line service, but a few served to the end of World War II, including some kamikaze missions. 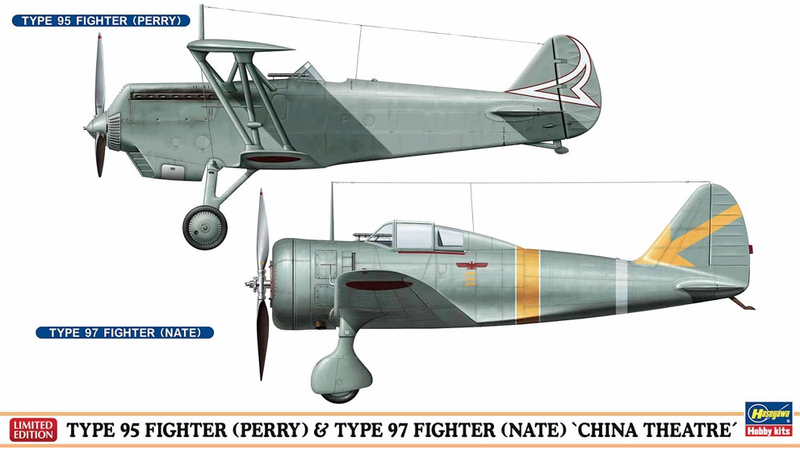 Hasegawa has introduced a 1:72 scale limited edition combo kit that includes these two aircraft, the Type 95 Kawasaki Ki-10 ‘Perry’ Type 97 Nakajima Ki-27 ‘Nate.’ Each aircraft is supplied with two sets of decals for aircraft. A special-interest pair, that’s for sure, but interesting nevertheless. The Type 95 could be of interest to fantasy fans as the basis for a dieselpunk alt-history flyer.